Only from the heart . ., which opens at Bihl Haus on May 16, features more than a dozen works by Haitian-born sculptor Marika Bordes. They combine influences from Marika’s early years with teacher Francois Sanon in Haiti, who works in the Afro-Caribben tradition, and contemporary art from her time in New York and Quebec. 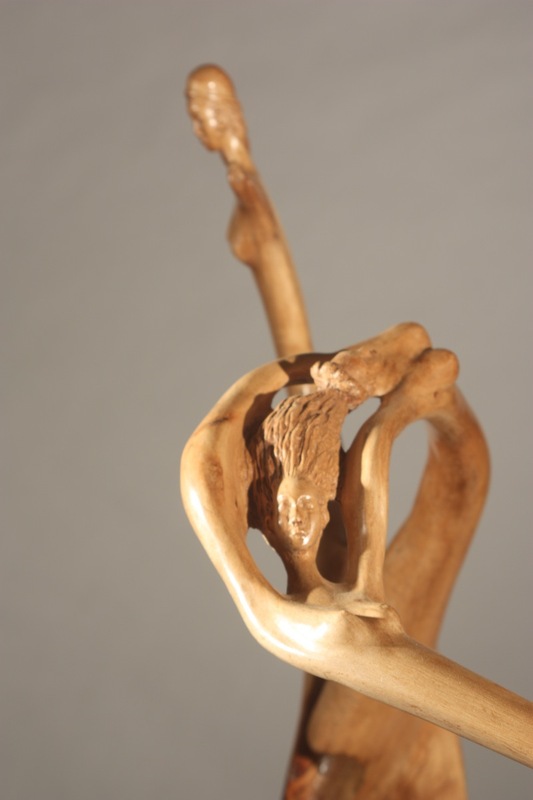 The resulting works in wood speak to the artist’s love of the material, understanding of the human form, and flawless skill with chisel and mallet. We’ll also be premiering the new catalog of Marika’s sculpture, which will be available for purchase. A little bit of Haiti in SA! WHAT: Only from the Heart. . . In this exhibit, we see with our hearts–the works are tender, romantic, sensitive—as well as with our eyes and with our minds—they are brilliantly conceived, flawlessly executed. Much like the French author who whittled down his original 30,000-word manuscript to less than half, Marika carved and chiseled an enormous 300-pound oak limb to reveal the essence of her own little prince. Crowned by curly locks and dressed in flowing cape and baggy pants, Marika’s boy dons forged metal boots that ground him firmly to the earth. To his chest he clutches a rose, his rose, his responsibility now because it, too, like the fox, has been tamed. Other works in the exhibit are based in reverie, dreams transformed into chiseled and polished woods, some embellished with added materials— a bit of ebony, a semi-precious stone, forged elements. In Dream to Fairytale (2013), what was once a knobby root is now a dreamlike womb, the birthing place of a goddess. 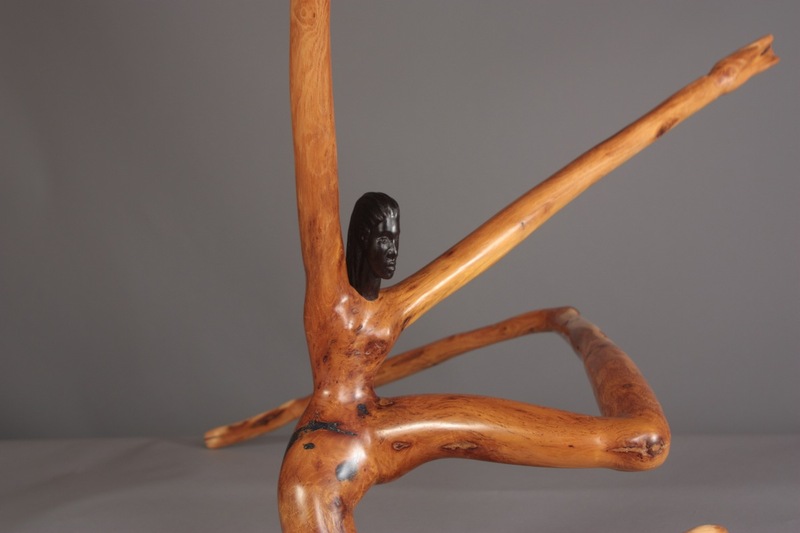 In other works, the human form is abstracted, elegant, long and lean, as in Grace (2010), a dancer-like apparition with ebony face and body of Bois d’Arc, a dense golden-orange wood native to Arkansas and parts of Texas. 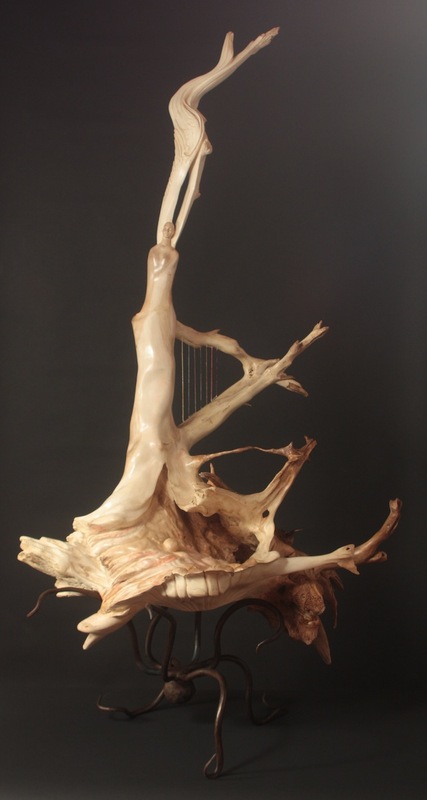 One theme that prevails in all of Marika’s work, however, is her love for the feel of the wood, the elegant twists of its branches, the subtle changes in its texture and tone. •Saturday, May 31, 2 pm: “The Little Prince as Inspiration,” an artist talk and sculpting demonstration by Marika Bordes, with a focus on The Little Prince (2014), created especially for this exhibit. •Saturday, June 14, 2 pm: “Haiti Today,” a gallery talk by Artist Marika Bordes and Dr. Ruth Berggren, Professor of Medicine and Director of the Center for Medical Humanities and Ethics (UTHSCSA), who spent her childhood in Haiti and now heads a medical mission there. About the Artist: Born on the Caribbean Island of Haiti amid towering trees, exotic flowers and mountains, then educated in a boarding school in Quebec, Canada, Marika (Marie Carmen) Bordes captured the best of two worlds. From 1996 to 2001, she studied with Haitian master wood sculptor Francois Sanon, who at first glance told her, “Madam, you can carve!” During this time, galleries exhibited her Afro-Caribbean-inspired work, she taught sculpting and Haiti National Television produced a documentary about her art. From 2001 to 2005, Marika spent time in Montreal and New York City developing and expanding her artistic talents. In New York, she studied drawing at the Student Art League under Terence Coyle, worked with Sanon, and received awards in 2002 and 2003 at the Rencontre des Arts. Also while in New York, The Pen and Brush, an international membership organization founded over 100 years ago for women professionally active in the arts, awarded Marika first prize in the 2003 African-American Art Exhibition. In 2005, Marika moved to Seguin, Texas, with husband Dennis Martin, where her studio is located today. Her efforts as an artist and arts activist have earned recognition. Peter Trippi, editor of Fine Art Connoisseur and juror of the San Antonio Art League and Museum’s 82nd Annual Artists Exhibition selected Marika for the Ann Griffith Ash Donor Award. Her sculpture The King and The Queen won honorable mention at the Texas Society of Sculptors competition at the Georgetown Public Library. For her community involvement, The Seguin Commission on the Arts awarded the artist the 2014 Arts Enrichment Award for outstanding contributions to and participation in the arts.